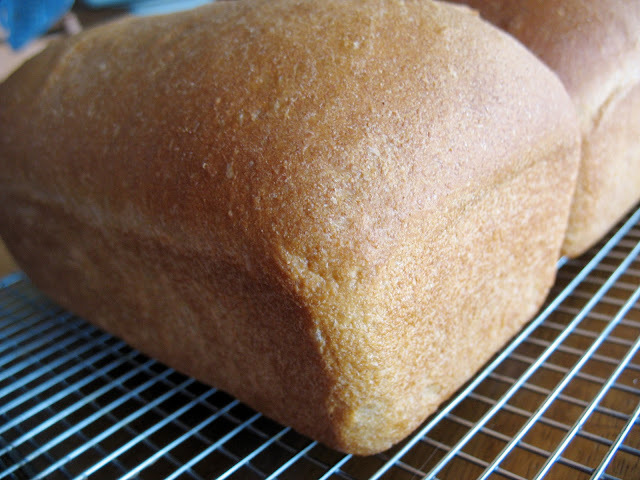 Frieda Loves Bread: Half & Half Honey Wheat Bread: Step-by-Step Instructions Included! 2 Half & Half Honey Wheat Bread: Step-by-Step Instructions Included! 2) it is easier to tell when you have added enough flour. From start to finish, I have been able to make this bread in 2 hours. It will make 3 medium 8x4 loaves or 2 large 9x5 loaves of bread. In a 4.5 quart mixing bowl, put your water, oil, and honey. Stir till dissolved. Place 3 c. wheat flour on top. DO NOT STIR....yet. Sprinkle your salt, gluten and yeast on top. Stir until flour is not visible. Lumps are o.k. SPONGING Cover and let mixture sit for 10 min. Add 2 c. all purpose flour. Mix thoroughly. Add 1/2 c. all purpose flour, mixing thoroughly each time. Dough should start to cling to the hook and begin to clean the sides. Between each 1/2 cup of flour added, knead for 1 min. Stop the mixer and check the dough. Dough should start to look "smooth." No large clumps of flour allowed! Touch the dough lightly. Dough should feel wet, not dry. If dough is sticky (leaving a LOT of dough on your fingers), add 1/4 c. flour and knead for 1-2 minutes. Check your dough. Dough should cling to the dough hook and your sides should have a little bit of dough on it. Touch the dough lightly. If it feels wet, but not sticky, it is perfect. Knead for 1-2 minutes longer. Remove dough hook, scrape down sides of bowl, oil the top and cover with plastic wrap. Let rise in 80*-85* location (oven with pan of hot water underneath) for 20-30 min. Uncover. Double Test: Take 2 fingers and "poke" your dough about 1/2". If the "dents" stay, it has risen double in size. If the "dents" try to rise back up, your dough needs more time. Take dough out of the bowl and put on clean, oiled surface. Shape each into a round ball and cover with plastic wrap. Allow dough to rest for 5-10 minutes for easier shaping. Shape each portion into loaves by oiling your surface, rolling into a 8x12 rectangle, taking the short end and rolling the dough towards you, sealing by pinching it tightly, pinching the ends of the loaf to fit the pan and putting it sealed side down in the loaf pan. Let rise for 20-30 min. Dough should be about 1" above the pan. Double test the dough by using your pinkie finger in a corner of your loaf. Dough is ready when dent stays in. Turn oven to 350* and bake for 30-35 minutes. If you want a softer crust, cover the loaves lightly with a sheet of aluminum foil during the last 10 minutes. Turn out loaves immediately onto a cooling race, paper or cloth towel. Cool completely before storing in plastic bread bags. Eat loaves within 4-5 days or slice and freeze. Storing bread in fridge will cause the bread to become dry and stale. thanks Frieda! You're awesome! I can't wait for some yummy bread after church!